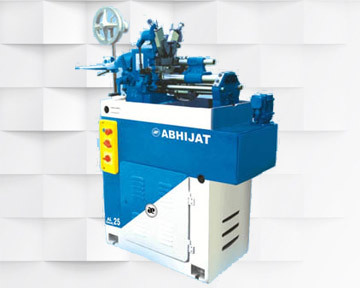 Abhijat automats are highly precision, robust and cost effective machines. They are most suitable for mass production of precision parts. These machines find application in Automobile, Electronic, Electrical, Textile and General Engineering Industries. 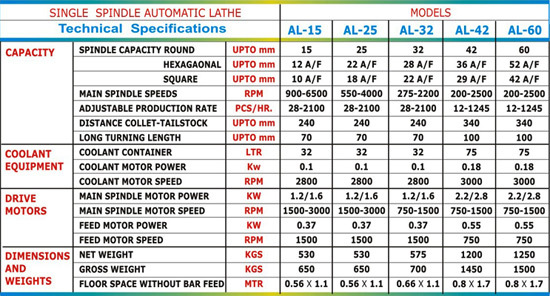 This machine is available in various models. Abhijat Automats are highly precise, robust and cost effective machines. These Machines find application in Automobile, Electronics, Bicycles, Diesel Engines, Radioes, Electrical, Textile and General Engineering Industries, for economic mass production of turned Components. Pedestal: The pedestal (machine base) is a rigid fabricated Construction, properly stress relieved to ensure Precision & vibration-free machining of Components with Superior finish. Spindle: The spindle is manufactured from alloy steel, accurately machined, carefully hardened & precision ground including threads. The Spindle, is mounted in Precision Imported Bearings in the front & precision deep groove ball bearing in the rear.